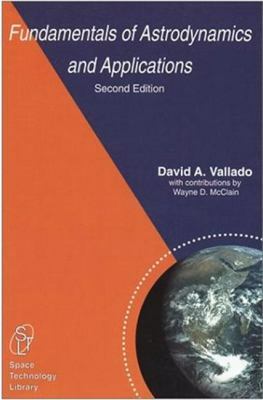 by Vallado, David Anthony, McClain, Wayne D.
Vallado, David Anthony, McClain, Wayne D.
Fundamentals of Astrodynamics and Applications is rapidly becoming the standard astrodynamics reference for those involved in the business of spaceflight. What sets this book apart is that nearly all of the theoretical mathematics is followed by discussions of practical applications implemented in tested software routines. For example, the book includes a compendium of algorithms that allow students and professionals to determine orbits with high precision using a PC. Without a doubt, when an astrodynamics problem arises in the future, it will become standard practice for engineers to keep this volume close at hand and 'look it up in Vallado'. While the first edition was an exceptionally useful and popular book throughout the community, there are a number of reasons why the second edition will be even more so. There are many reworked examples and derivations. Newly introduced topics include ground illumination calculations, Moon rise and set, and a listing of relevant Internet sites. There is an improved and expanded discussion of coordinate systems, orbit determination, and differential correction. Perhaps most important is that all of the software routines described in the book are now available for free in FORTRAN, PASCAL, and C. This makes the second edition an even more valuable text and superb reference. Copyright is shared with Microcosm.Vallado, David Anthony is the author of 'Fundamentals of Astrodynamics and Applications', published 2001 under ISBN 9780792369035 and ISBN 0792369033. Loading marketplace prices 2 copies from $175.00 How does the rental process work?